Home » Posts tagged with "chickens"
A new website exposing the truth about the number of animals killed by the meat industry has just launched in Canada. Animal Clock, already available in the US and the UK, raises awareness about the vast number of animals raised and slaughtered for food, breaking down slaughter numbers for each type of animal commonly killed on modern farms. Animal Clock features a live calculator showing how many animals are being killed by the Canadian meat industry. Nearly all of the animals slaughtered were first raised on commercial farms, where physical and emotional suffering and deprivation is the norm. Animals are confined in large, crowded barns. They experience painful procedures such as debeaking and castration without anesthetic, and many animals never see the light of the sun or breathe fresh air until the day they are shipped to the slaughterhouse, often at only a few months of age. The startling number of animals slaughtered in Canada each year is a wake-up call. In 2017, Canada killed over 800 million land animals for food. This is up from 771 million in 2016, as people are eating less cows but more chicken flesh. Chickens are smaller animals, so more of them must be killed to produce the same volume of meat. Animal Clock also acts an advocacy tool, empowering citizens to stand up against the cruelty of the meat industry. The site explains how Canada’s legal system fails animals, why our laws are among the worst in the western world, and calls out the government for blocking many attempts to improve our laws. In the “You can make a difference” section, Animal Clock breaks down how people can get change the world for animals by sharing information with others, getting politically active, voting with their wallet, and reporting animals cruelty when they see it. Finally, the site highlights the plant-based movement that is rapidly expanding across the country. A cultural shift away from meat consumption to plant-based eating is good news for animals, human health, and the environment. Now that’s something to celebrate! See the new Canadian edition for Animal Clock here. 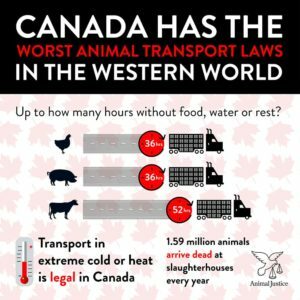 Access to information documents obtained by the Canadian Coalition for Farm Animals and reviewed by Animal Justice reveal that new proposed animal transport regulations were drafted in collusion with the animal agriculture industry itself. In reality, far from reflecting the latest science, the proposed regulations virtually ignore a vast body of science relating to transport times without food, water or rest; exposure to extreme temperatures and weather; and severe overcrowding aboard jerkily moving vehicles. Instead, the access to information (ATI) documents reveal that the government’s primary concern was appeasing the industry by ensuring they would be required to change very little, if anything. For example, spent hens—the young but fragile chickens “used up” by the egg industry—are so debilitated by the time they’re sent to slaughter that the brutal transport conditions can kill them. In fact, the ATI docs show that in 2014, loads of spent hens were arriving dead at slaughterhouses at rates of up to 51.59 percent. This wasn’t an anomaly: 17.4 percent of shipments had dead on arrival rates higher than 4 percent, the rate at which regulators step in to investigate, assuming negligence. These suffering-to-death rates are a direct result of transport conditions. Yet, the ATI docs reveal that instead of mandating a 12-hour limitation on transporting these vulnerable birds without so much as a sip of water, the government caved to industry pressure in mandating a 24-hour limit—a timeframe that is guaranteed to sentence millions of animals to extreme suffering and even death. Internal Government Doc From Access to Information Request. Industry concerns dictated transport times. In one document, the government assured industry reps that on-farm feed and water withdrawal times are “not strictly enforced” (this is the period of time animals are deprived of food and water before transport. These withdrawal times will be included in the new transport time limitations). Any discussion of weather exposure was also strikingly absent. Evidently, the government didn’t even consider meaningfully regulating this primary source of suffering and agonizing death. Ultimately, the lives of animals used for food are characterized by misery and deprivation from birth to death. So why the focus on transport? In other words, the government needs to deal with transport to maintain the illusion of animal welfare in our animal agriculture system. Image: Severely crowded young chickens being transported into an egg-laying barn; Alberta 2013. Via Mercy For Animals.